Seeing my Long Exposure shot scoring lower than I anticipated, I decided to shoot an entry for Neon Signs as well. 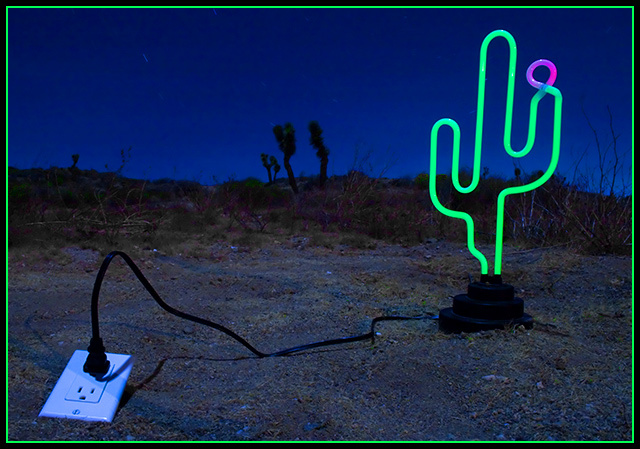 ;) I had been wanting to shoot something similar to this (with my uncle's neon cactus) for quite some time, so this challenge was a perfect excuse! It was shot in a relatively remote area of the high desert. I parked on the side of the road and ran 200' of extension cord down a hill from the inverter in my car. My friend stayed in the car and flipped the inverter switch on and off to light the cactus up when I told him to. Creative idea and great composition, I love it! great work - glad I gave it an 8! Great shot and title... I didn't get to vote in the challenge, so I'm commenting now. And the appropriate response to the cop would have been "Here's Your Sign" Congrats on the blue. Brilliant! Well done on the blue ribbon! Awesome picture and hilarious story! Great wildlife shot! Outstanding idea and excellent execution. Perfect for the challenge and so worthy of the top prize... well done! Sweet ~ Congrats on the blue!!! This was one of my top picks!! Congrats on your blue!!! Certainly a photo and a story to remember for a long time to come!!!! Well done. I would like to publicly apologize to Sean for my 2 vote. I am a new member and this is my first time voting. I was quickly flipping though the photos and when I saw that one I didn't think it was real, I thought it was fake. Can you see the descriptions before voting? If I had read Sean's description I wouldn't have made that mistake. Is there someone I can email to change my vote? Anyway I'm glad that my stupidity didn't cost you a blue ribbon and I hope you will accept my apologies and congratulations! Is there a way to change a vote? I realize now that I need to vote on the actual photo and not what I think it was or was not...Leave the reviewing up to the site admins. I apologies to the whole site for that. I look forward to participating in the future and will not make that mistake again! "Right there, right there - see that blur? I call this one 'Squirrel by Moonlight'"
This was my only 10 of the challenge. Very creative -- I certainly enjoyed reading your description! Aren't power inverters nice? Very creatvie idea, congrats on your blue ribbon! I would love to know what the folks who voted 2,3, or 4 were thinking. That's funny...Saguaro Catus aren't even native to Las Vegas or even to Nevada. Unbelievable...congrats. I had a great laugh when I read your story. If you light the tail it makes a great trail!! Oh God... I'm a poet and I didn't knowit! I had this one pegged for a ribbon. Very creative in a difficult challenge. Well thought out and executed. Congrats on the blue. It's a pleasure to share the fornt page with you! Very cool! Congrats on the ribbon! I didn't vote on this challenge, but this is just fantastic! Even better is that you took the time to share the background on how the shot was done. I think I see that nighttime desert squirrel running around back there in the background! :P Great job, and congrats on a well deserved blue! Congrats dude, I didn´t vote but judging from the top 20 thumbnails, the best shot won this challenge as far as I am concerned, good creativity, very much in spirit of Scalvert´s shots. This was my only 10 - It was perfect - When a picture makes you wonder how it was takenand is also well executed - Then thats 10 in my book. Really well done. This would also make a great poster! Dude! You do me proud once again! :D I knew this was a winner the moment I saw it. Congrats..
Congrats on the blue! Man you've been on fire lately. Congratulations on your BLUE. This is a smashing clever response to this challenge! Like the composition of the photo! At first, I thought it just one of the ordinary but it's different when I looked closer. Nice! Fun shot!!! Very creative and your neon is very nicely shot. I also like the green border. Nice idea. I believe the outlet could be in the background and still have the desired effect. I like your creativity. 8. Most original idea in the bunch! Well done! I see horizontal stripes in the sky - too much noise reduction? Clever idea, good luck in the challenge! The border and border color was a good choice and enhances the photo. Creative entry! The angled outlet pulls me away from the neon a bit. You just made me laught. Great idea!! Extra points for clever (and well executed too). personaly I find the border a bit distracting, especialy with the colour maching the neon, but the title, and the whole idea, is just great. the most origanel shot here, framing is perfect, and the power point in the dirt, just love it. Proudly hosted by Sargasso Networks. Current Server Time: 04/24/2019 08:45:59 AM EDT.